Robert Johnson was born May 8, 1911 in Hazelhurst, MS. In celebrating the centennial of Robert Johnson’s birth, a superb musical collective traced the bluesman’s legacy from its humble beginnings to meteoric impact during a moving and wildly entertaining show Friday at the Berklee Performance Center. Guitarist and singer Todd Mohr anchored the proceedings, and his mates from Big Head Todd and the Monsters filtered among a cast that also included Delta blues upstarts Cedric Burnside & Lightnin’ Malcolm, venerated elders Hubert Sumlin and David “Honeyboy” Edwards, and the celebrant’s grandson Steven Johnson. Read more at The Boston Globe website. May 8, 2011, marks the 100th birthday of Mississippi Delta bluesman Robert Johnson, who, according to legend, sold his soul down at the crossroads of Highway 61 and Highway 49 in a midnight bargain that has haunted the music world for three-quarters of a century. The ‘deal’ brought forth Johnson’s incandescent guitar technique and a run of 10-inch 78 rpm singles for the Vocalion, Oriole, Conqueror and Perfect labels recorded in San Antonio in 1936 and Dallas in 1937. Those songs have become a cornerstone of Columbia Records’ identity, and will be celebrated on two CENTENNIAL releases from Columbia/Legacy. On April 26, but available for pre-order now, Sony Music/Legacy Recordings will release two items celebrating the Robert Johnson Centennial. 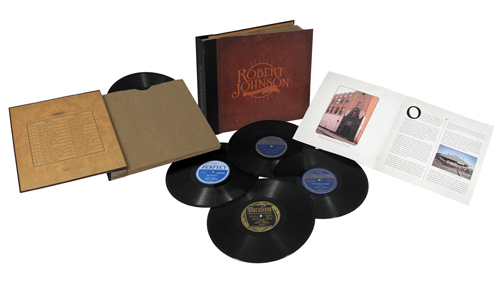 Robert Johnson The Complete Original Masters: Centennial Edition is the ultimate collector’s vinyl piece. Recreated in the historic look and feel of the twelve 10″-78rpm discs that originally carried Johnson’s music into the world, these Limited Edition collector’s sets are individually numbered to 1000. Housed in a lavish 10″ album book, each vinyl disc plays at 45rpm and is outfitted with reproductions of the original record labels. An additional sleeve will house a smaller book that includes a new 1,500-word essay written by Ted Gioia, Texas-based pianist and music historian, along with complete historic track annotation and discographic data. This item will NOT BE SOLD IN STORES, it is only available through www.thecompleterobertjohnson.com. As an extra bonus, all orders for Robert Johnson The Complete Original Masters: Centennial Edition will include three bonus items. 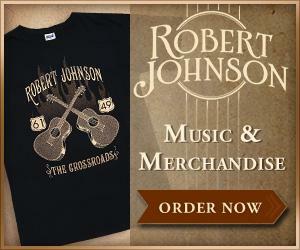 Robert Johnson: The Centennial Collection, a new version of 1990’s The Complete Recordings updated for a new generation. Rarities From The Vaults, a double CD comprising Blues from the Victor Vault, a dozen rarely-collected 78s from the Victor archive by Frank Stokes, Tommy Johnson, Sleepy John Estes and other recorded between 1928 and 1932, as well as Also Playing …10 tracks featuring artists recorded during the same San Antonio and Dallas sessions as Robert Johnson. The Life & Music of Robert Johnson: Can’t You Hear The Wind Howl? a DVD of the critically-acclaimed 1997 documentary film, directed by Peter Meyer, hosted by Danny Glover, and featuring Keb’ Mo’ as Robert Johnson. The 76-minute film also includes interviews with Robert Cray, Johnny Shines, John Hammond, Honeyboy Edwards, Robert Lockwood Jr., Henry Townsend, Eric Clapton and Keith Richards. The Centennial Collection will also be released in stores as a separate item. The 42-song set, 29 original songs plus alternate takes, includes a new essay by Ted Gioia alongside a new biography of Robert Johnson written by Stephen C. LaVere (completely different from his essay in the 1990 version). Also included are new illustrations and photo images. In mid-March, The Robert Johnson Blues Foundation will announce a series of national and international centennial events for “The King of Delta Blues.” Steven Johnson, the Vice President of the Foundation and grandson to Robert Johnson, explains: “My grandfather is revered globally. This centennial celebration involves combining a unique blend of theatre, live musical performances, artistic exhibits and dialogue that highlight the complexity of his life while celebrating his genius. Our events will be following the Robert Johnson Blues Trail, which will allow us to travel to many of the cities where he shared his talents and where his music is most loved. This is important because his voice, style and musical gifts were the foundation for American popular music.” Stay tuned to www.RobertJohnsonBluesFoundation.org for more information on these events as it is released. In the seven decades since his mysterious death, bluesman Robert Johnson’s legend has grown — the tragically short life, the “crossroads” tale of supernatural talent, the genuine gift that inspired Dylan, Clapton, and other greats — but his image remains elusive: only two photos of Johnson have ever been seen by the public. In 2005, on eBay, guitar maven Zeke Schein thought he’d found a third. Schein’s quest to authenticate the picture only led to more questions, both about Johnson himself and about who controls his valuable legacy.